Cupcake liners are the first point of actual contact between your cupcakes and your cupcake fans. Before your exquisite frosting delights taste buds, your delicious deserts will be clutched and steadied by their cupcake wrappers. Buying baking cups that flow with the cupcake experience you've designed as an artist is great, but it is fantastic when this can happen at a price that's nice. 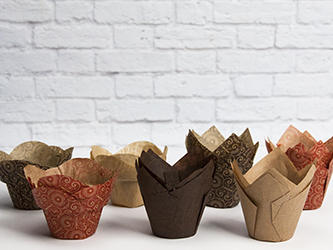 Your premium cupcake liner begins (and pretty much ends) with the material. The liners listed below are formed from greaseproof paper providing a moisture barrier that works from oven to lovin'. But greaseproof doesn't have to look boring. The tulip baking cup style is such a step up from the traditional pleated look, even our natural baking cups strike a stately silhouette. If you want to go a step further, the printed baking cups may be the ideal accent to polish your presentation.